I recently got a copy of Live 9 and realised that Ableton introduced some new functionality that is of great use to nwdlbots. You can now apply automation envelopes to control parameters from within clips. This offers the possibility of using the envelope view in a chord sender track to set the chord types while still using pitch values to set the root note of each chord-scale. This means you can see both parameters at once! More tracks online made with nwdlbots. First there’s nwdlbient parts 1 – 3 by (the) 99942 from d4management in St. Petersburg . Three albums, totalling 30 tracks on soundcloud. I’ve just started listening to them and there’s some interesting stuff. Then there’s some tracks by Ben Glawe’s Conflict of Confidence project of which he says “All but track #4 are essentially exercises in nwdlbots“. Here are two more nwdl tracks on soundcloud. These are both from well-known electronic composer, synthesist and sound designer Ian Boddy. Both “demos” feature Ian’s Serge modular analogue synth. I’m going to be giving a presentation on nwdlbots at the Max 4 Users convention to be held on January 13-14 2012 at Phoenix Square Arts and Digital Media Center in Leicester, UK. Also there will be David Zicarelli, Julien Bayle, Nick Rothwell and many others giving presentations, workshops and performances. A few people around the web have started to post mp3 tracks showing what they’re doing with nwdlbots (pronounced noodlebots). I’m very interested to hear how different people are using the bots and would like to post links on this site so that others can hear them too. Please get in touch if you’ve got something. Here’s one track I found yesterday. It’s from devsound (“label, blog, and whatnot”) in Sweden and it features some bots talking to a Blok modular synthesizer. I’ll also put some of my own tracks up soon. Author richardPosted on September 14, 2011 September 14, 2011 Categories News, nwdlbotsTags Ableton Live, Blok, nwdlbots, TracksLeave a comment on nwdl tracks? Here’s the third video tutorial for nwdlbots (pronounced noodlebots). This tutorial shows how to make Event Bots follow a sequence of chords. In this example, a single guitar bot “gets down with its bad self (so to speak)” by noodling over an 8-bar “jazz” rhythm pattern. Thus demonstrating that nwdlbots are not just for ambient music. This is the last tutorial for nwdlbots 0.1. More bots are coming in the next release. 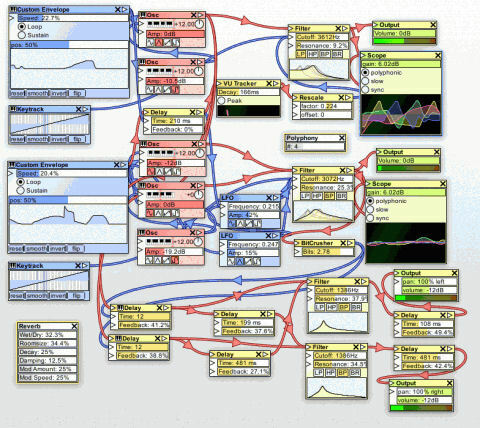 (Ableton Live and Max for Live required). The announcement of a forum for nwdlbots was a bit premature. My choice of forum software presented a number of problems and I have had to suspend this addition for the time being. I will make another announcement once I get something working. In the meantime, do not hesitate to use the contact form if you need to get in touch. I’ve just finished the second nwdlbots tutorial. This episode demonstrates the way in which nwdlbots can interact within a Live Set using two modules called noodle control and noodle send. By attaching noodle sends to each EventBot in a set, you can relay MIDI information to the control module, which collates the information and then feeds it back to the EventBots, informing their decisions regarding onset and pitch. This allows the bots to work together controlling the density and harmony of the set. Following the last couple of weeks’ enthusiastic response to nwdlbots 0.1, I’ve decided to open up some forums on this site. So, if want to talk about nwdlbots, ask any questions, post links to tracks you’ve made using the software or even tell me about any bugs, then go to the forums link above. Here’s the first of a series of tutorials about nwdlbots.This tutorial describes how to build an EventBot from three basic modules: Event Generator, ScaleBot and DynaBot. In future videos, I want to talk about making the bots interact, chord following and a whole bunch of other stuff. Please let me know if you find this stuff useful.